Working adults like me love friday becos it's the last working day of the week. Unless your company requires you to work on weekends then too bad i guess. As usual, we go central or bedok south to have our lunch but for past few fridays, there can only be one thing "MACDONALD". The crazy fest to collect the Coca Cola cups have got into us lol. 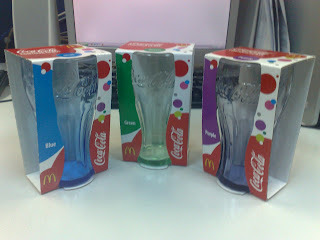 The cups i collected so far are blue, green and purple.